In 1858 Sir Henry Bessemer patented a coal cleaning process using a cone shaped ves­sel and salt as the separating medium. Since then different vessel shapes and separating mediums have been proposed and used. The first process to achieve com­mercial success was the Chance process (1921), using a cone shaped vessel and sand as the medium. A few Chance cones are still in operation. Today, the primary dense medium system is a direct descendent of the HMS ("heavy media separation") process introduce to coal in about 1940. It has been and is still used for minerals. A typical dense medium cyclone circuit is shown in the attached sketch. This circuit consist of an ore feed, a set of desliming screens to pre-size the feed to the vessel, dense media vessel, media drain and rinse screens, and a media control circuit. It is often combined with a dense medium cyclone circuit and a fines circuit to process material of a finer size. Vessels come in several different sizes and configurations. The media may be added with the feed, or as a separate input to the vessel. The feed can be fed over an end, or in the center, and then flow across or be submerged by a wheel. 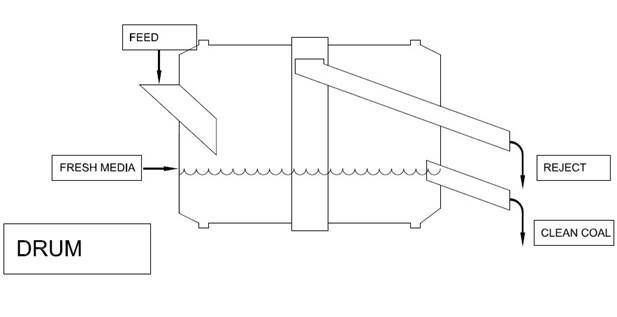 Dense media vessels may be classed as vessels (Figure 1), tanks (Figure 2), drums (Figure 3), or combinations of these. The basic separation process is the same regardless of vessel geometry. The advantage of the vessel (“Barvoy”) over the others is for a feed that has a lot of near separating gravity material. The paddles assure submergence, which assists separation by assuring complete wetting of the feed particles. The tank style is the mechanically simplest, while the drum has all mechanical drive mechanisms outside of the bath. The feed (ore or coal) is slurried in a medium with a specific gravity close to that of the desired separation. The lighter fraction floats and the heavier fraction sinks. The two fractions are then mechanically separated. While other media have been used, most dense medium processes are done in suspensions of magnetite in water. This suspension is achieved using very finely ground magnetite. By varying the amount of magnetite in the suspension, the specific gravity of the medium is changed, which changes the gravity of separation. 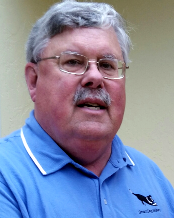 The process is versatile, offering easy changes in specific gravity to meet varying market requirements, and the ability to handle feed fluctuations in terms of both quantity and quality. In practice feed sizes may range from a top size of 150 mm (6") to a bottom size of 6.35 mm (1/4"). The feed to any particular vessel will cover a portion of this range, normally a spread of 4x (i.e., 100 mm x 25.4 mm), but sometimes covering wider ranges. For coarse feeds (+1/2" bottom size), dense media vessels provide the most precise separation currently available. Dense medium separations are very precise and achieve high grade and recovery. The size of a dense medium vessel is usually expressed in tons/hour of floating material capacity. Vessels are sized on the tonnage capacity capable of discharging over the float weir, with a check on the sink material handling capacity. For operations where the float material is above 70% the most important factor is the float tonnage. For float percentages, the ability to efficiently remove the sink material is often the constraint on vessel capacity. Figure 4 and Table 1 show the normally accepted ranges for vessel float capacity based on weir width. 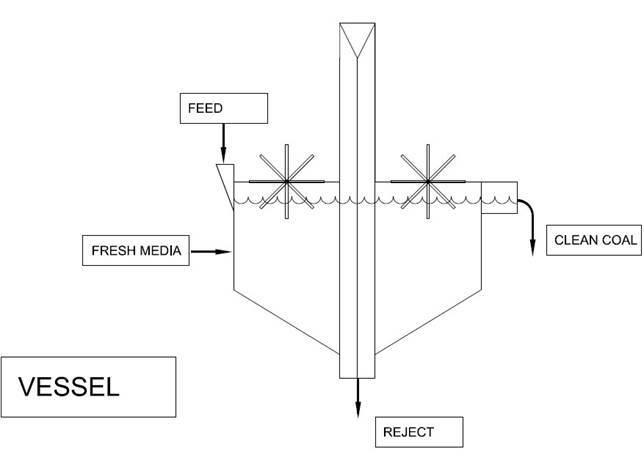 For feed with a float fraction below 70% use 75 to 80% of the capacities listed in Figure 1. For improved efficiencies, especially with difficult to float feeds, shallow pool vessels or drums give improved performance (110 to 120% of above). Sink material handling capacity is normally taken as 10 tons/hour/foot of discharge width, regardless of method (elevator or weir). Media to feed ratios are in the range of 3:1 to 5:1. The higher the percentage of near gravity material, the higher the media to feed ratio. For easy to float material (i.e. coal) (less than 10% of the material within 0.1 Specific gravity units of desired separating gravity) less media is required for good operation (media to feed = 3:1). For hard to float feeds (over 15% near gravity) more media is required (media to feed = 5:1). 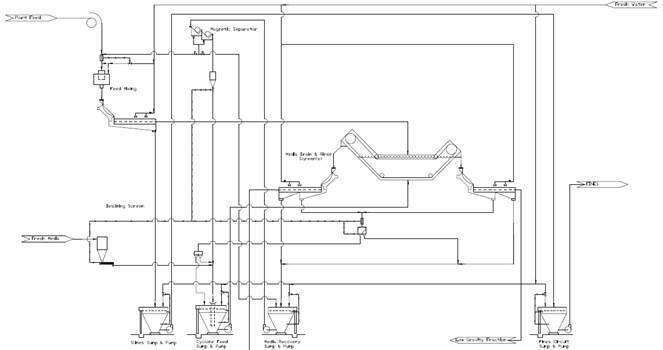 The following is an example of sizing and selecting a dense medium vessel on coal. It is included for reference only. In actual practice many different factors can cause the specific selection to change. 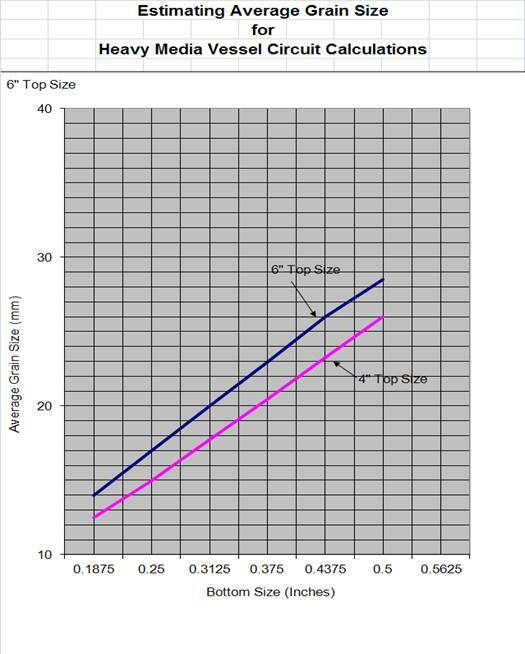 For a 4" top size and a 1/2" bottom size, the average grain size from Figure 5 is, 26 mm. Going to Figure 3 with a 26 mm average grain size and looking for a prediction of vessel performance gives an Ep of 0.017. 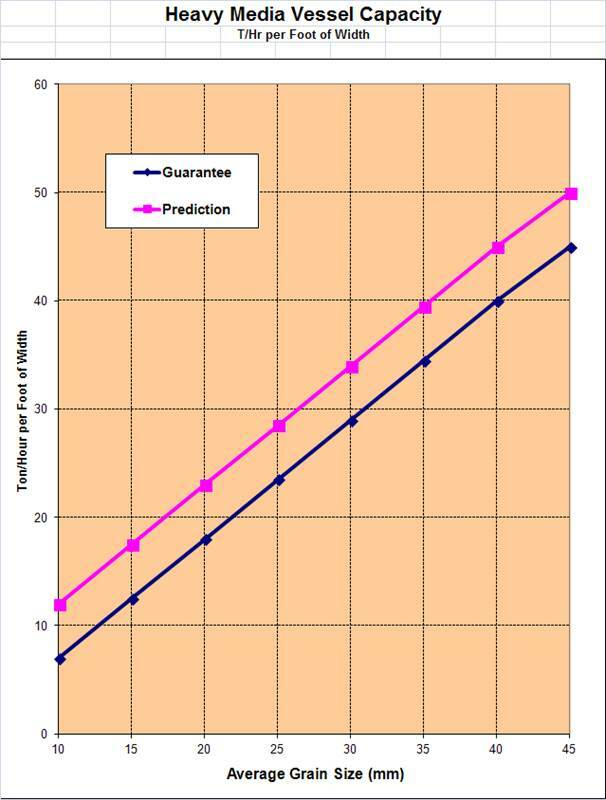 If washability data was available, the 1.50 curve could then be used to predict the yield. Figure 5 is used to calculate the average grain size fraction being cleaned. Using the average grain size of 26 mm and going to Figure 3 or Table 1, the design tonnage capacity would be 30 tons/hour per foot of width. With 80 % or 160 tons/hour reporting to clean coal this requires a clean coal weir of 160/30 or 5.33 feet. For raw coal a weir of 6.67 feet is required (200/30). Alternatively two vessels each with a 3 foot 6 inch weir could be used. For refuse handling the 80% to clean coal gives 20% or 40 tons/hour reporting to refuse. This does not constrain the vessel size at all. Initial sizing gives two 3'-6" wide vessels or one 7'-0" vessel. Physical plant layout constraints would determine whether one or two vessels is better. Calculation of a dense medium circuit is the determination of the amount of media circulating in that circuit and the amount of media (magnetite) lost to dilute media. The amount of magnetite lost to the dilute media circuit is directly dependent on the average grain size and specific gravity of the material being separated (i.e. coal or refuse). Where Dn is the average grain size of the solids (coal or refuse) and SG is the specific gravity of the solids. This is the solids in the feed stream to the drain and rinse screens or sieve bend. T/H is the solids flow rate in tons per hour to the D&R device. G/M is the gallons per minute of pulp. SEPARATING GRAVITY: From figure 4 determine the desired separating gravity and the desired media gravity. From this information refer to pulp conversion data to determine the volume of magnetite in the media. DILUTION WATER: From the screen sizing sections determine the amount of rinse water to be used on the D&R Screens. In addition, determine the amount of surface mois­ture on the final products (this is often a given and the circuit must be designed to meet it). LEVEL CONTROL: To balance the circuit an amount of media must be bled to the dilute media circuit or water and media added. In actual practice the amount of media lost on final product and in the dilute media circuit will require a positive addition of water and magnetite. In balancing a plant the calculations may indicate a build-up which will require a circuit bleed. To prevent fines build-up a bleed is often desirable.